Over the last 12 months, netbook and mobile Linux has made massive advances in features and install base. This is primarily thanks to two netbook distributions – Moblin and Canonical's Ubuntu Netbook Remix (UNR). Both have built on the massive potential that was unlocked by the Asus Eee PC but led nowhere, as its operating system failed to inspire a new generation of Linux users. There's a new breed of netbook distro that's aiming to change this perception and take the fight for the perfect mobile platform back to the manufacturers. Netbooks aren't the only portable platform where there's innovation to be found: there are millions of mobile phone users completely oblivious to the fact that their devices are powered by Linux. And that's just the way it should be. But there's a growing number for whom it will become increasingly important, whether that's through Android or Nokia's latest gadget. We're going to document the current state-of-the-art in mobile Linux, and uncover the innovation and the technology that has enabled recent developments to happen. And we're going to start with netbooks, as these desirable items are becoming increasingly important. Ideally, a netbook OS needs to take into consideration three things: the limited amount of screen space that these devices typically have, the need for applications to be quick and responsive, and fact that these devices have to last as long as possible without being connected to a power source. And this is exactly what both Moblin and Canonical's UNR have been designed to accomplish. Moblin's great advantage, and the reason why it's been such an important development for the Linux netbook platform, is that it started life as an Intel project (it's now under the guardianship of the Linux Foundation), and Intel makes the hardware that the vast majority of netbook devices use. This meant that the company had an unparalleled knowledge of the inner workings of these devices and also had the opportunity to make them work to the best of their capabilities by adding drivers and various other components to the Linux kernel. Despite all the work that has been done in the background for Moblin, it's the user experience that most people will judge this distribution on. Moblin uses a toolbar that scrolls down from the top border of the display, and from this, you can launch any of Moblin's apps, including a Mozilla-based web browser, an instant messenger client, media player and home screen. Canonical put a great deal of effort into developing Ubuntu Netbook Remix, pulling massive boot speed improvements, power management code and a new window manager into the standard Ubuntu distribution. 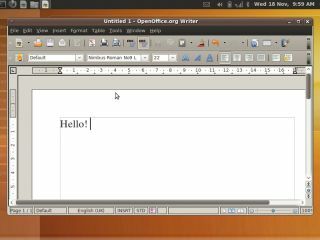 It also makes good use of recent additions to Ubuntu, including the Ubuntu One cloud storage system and the Empathy instant messenger, which makes good use of the limited screen sizes on these devices. But the best thing about UNR is the breadth of packages available. You can install anything that any other Ubuntu user can, which is a massive advantage if you look at the tiny selection available for Moblin. UNR has been tried and tested on the Intel Atom platform that most netbooks use at their core, so you should expect better battery life and reliable suspend and resume, for instance. One thing we don't like about the latest release of UNR is the installation routine. Canonical has tried to make things easier by only distributing UNR 9.10 as an ISO image that needs to be burned on to a CD. But of course, netbooks don't have optical drives. To get around this, Canonical wants you to use its USB Creator application. We had little success getting this to work on a couple of Ubuntu based distros, and had to resort to the Windows version that can be found in the root directory of the ISO – which means you need to mount it first, somehow. On Windows, you will also need Python 2.6 installed. By comparison, Moblin is provided as an IMG file, the same as UNR used to be, and this can be copied using dd on the command line. It takes a long time, and it's more technical than it should be, but because you have control of the block size with the bs argument (we used bs=1024), the writing process shouldn't fail. We'd love to see Canonical providing both packages.